Nevada officials would like to use a new combination of drugs for the state’s first execution in more than a decade. Lethal injection experts around the country are expressing their concern. In 1977, Oklahoma became the first state to adopt lethal injection execution. 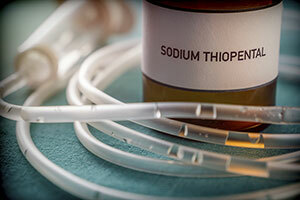 The three-drug protocol, developed by Dr. Jay Chapman, included the sedative sodium thiopental, a paralytic pancuronium bromide, and potassium chloride to stop the heart. Other states implemented similar protocols for lethal injection using these same drugs. However; in recent years, many pharmaceutical companies have stopped manufacturing and selling these drugs, causing a shortage. In some cases, companies that make life-saving drugs refused to export drugs to the United States that would be used to end lives. Nevada’s new protocol includes the sedative diazepam, the painkiller fentanyl, and the paralytic cisatracurium. Diazepam is intended to induce sleep, fentanyl will depress breathing to cause death, and cisatracurium is intended to make death a certainty. None of these drugs have been used in executions before. This new protocol was developed by Nevada’s chief medical officer, an anesthesiologist. The chief medical officer resigned two weeks ago, but said that his resignation had nothing to do with executions. The new protocol was scheduled to be used in the execution of Scott Raymond Dozier. A stay of execution was filed and the district court judge ruled that the execution could go forward, but only with diazepam and fentanyl. The state attorney general’s office has said that it will appeal to the Nevada Supreme Court. If this drug combination works without complications, the protocol could be used by other states as an alternative execution method. However, experts are not convinced that the new protocol will work. Deborah Denno, a lethal injection expert and law professor at Fordham University, says, “It’s an experiment. . . . It sounds like a high-risk venture. Even trained people can’t claim to know what’s going to happen.” One risk is that the combination of diazepam and a high dose of fentanyl could cause complications such as vomiting.